Global Advanced airport display system is majorly driven by the growing adoption of passenger mobile applications. Display system of airports uses enhanced connectivity solutions such as Bluetooth and 3G or 4G connectivity to activate the display on smartphones and tablets that are significant to specific location and perspective of the passenger. For instance, SITA, world's leader in transport communication and information technology has installed more than 50 beacons at Hong Kong International Airport. Hong Kong International Airport is one of the first airports in Asia-Pacific leading its way with trials of innovative beacons to provide key information directly to passenger's smartphones or tablets. This innovative technology uses top-notch interactive maps to guide passengers, check-in counters, boarding/arrival gates and real time flight information among others. These beacons also provide information about shops, restaurants and lounges. Also big market players are collaborating with airport authorities and IT resellers to mark strong presence in emerging markets. For Instance, Samsung Electronics announced its strategic alliance with Ikusi and Zafire, leading companies providing intelligent global airport solutions, to deliver real-time information display solutions to airport industry. Airport authorities are spending huge capitals to maintain their efficiency in mid of growing number of air passengers and to facilitate the passenger experience. Airport information Systems is helping the airports by enhancing their productivity and efficiency by increasing their revenue. More than 45% of airports revenue is generated by the non aeronautical businesses such as retail outlet, restaurants and luxury waiting lounges. 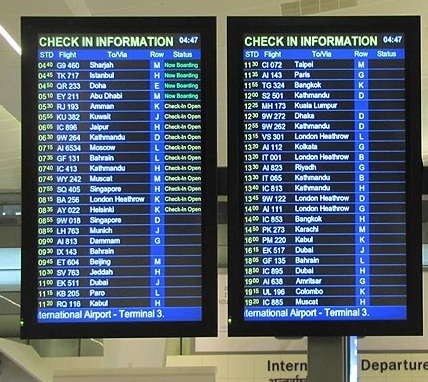 Integration of advanced information technology and system that improve the efficiency of airport with enhanced passenger experience is expected to bolster the growth of global airport display systems market. Air passengers with disability and visual impairment necessitate special assistance from both airport operators and airlines. Hardest obstacle passengers experience during air travel is to navigate their way through an airport. Therefore, airport operators are implementing various technologies to aid sensory disabled passengers to navigate their throughout the airport for boarding/arrival gates, restaurants, lounges, security check-gates, ease to check-in and also provide real time flight schedules and information among others. About 40% of global airport authorities' consider implementation of smart technologies as their secondary objective to reduce the cost of operations for this market, after improving passenger experience. To improve and equip the airports with advance technology, operational spend for airport IT has been enlarged from USD 10.6 Billion in 2013 to USD 14.7 Billion by 2024.